If you are looking for roof cleaning or roof moss removal in Norfolk we can help you. Smartseal UK Ltd has an enviable reputation for its top quality roof cleaning and restoration service. We have an extensive network of registered professional roof cleaning companies located throughout the county of Norfolk servicing the Towns of Norwich, Diss, Kings Lynn, Thetford or Wells Next The Sea and all surrounding Towns and Villages in Norfolk. The damp climate Norfolk can create the perfect conditions for moss, algae and lichens to thrive on a roof. Not only does moss look unsightly but it can also cause other problems such as gutters and downpipes becoming blocked. In addition, the extra weight of wet moss can cause stress on the roof structure. What's more, during winter the freeze-thaw process may cause tiles to break. This can cause premature degradation and the appearance of your roof to deteriorate not to mention it could also cost you a substantial amount of money in roof repairs. Organisms and bacteria are on many roofs because of the damp climate in the UK. However, there is good news we can safely and effectively get rid of this rooftop menace. The first step is to carry out the roof moss removal with specialist equipment. After this, we then treat it with Moss Clear Pro biocide to impregnate the roof tiles and stop germination of the spores. Plus it remains active for approximately 3-4 years, we then advise regular maintenance treatments. Moss Clear Pro can be used all year round, and it is a safe and green way to prevent algae and moss. 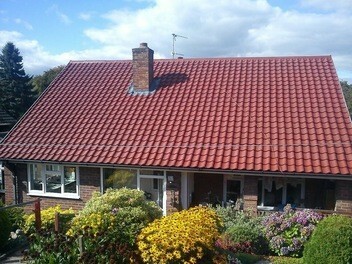 Most people are not aware as to what can be done to restore colour to old roof tiles. Roof tile painting is fast becoming more commonplace these days due to the advances in roof coating technology. Painting roof tiles can certainly improve the look of a home and is a lot cheaper than having all the roof tiles replaced. An application of a good quality roof paint doesn't have to cost too much but can add significant value to the 'kerb appeal' of a home. Sheet up ground floor areas and conservatories and disconnect or block downpipes to alleviate any moss or debris flowing into the subsurface drainage system. Roof cleaning is carried out in a top-down manner removing all roof moss, algae, dirt and airborne pollutants that have accumulated over the decades. A roof inspection to determine if any necessary roof repairs are required which will then be discussed with you in detail and a quote for the work will be provided. With any roof repairs having been completed the roof is then treated with a fungicidal wash to ensure that moss spores are eradicated. Option to apply either a clear solvent free impregnating roof sealer or a coloured roof coating from Smartseals Climashield™ popular product range. 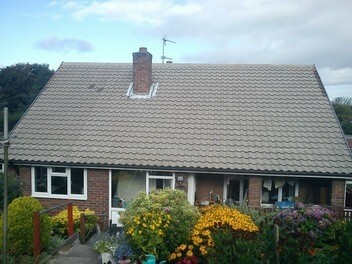 This will complete the work leaving you with a roof that looks like new and is free of green growth. This will help keep your roof protected for years to come. Climashield™ roof coating is available in a range of popular colours and has been submitted for independent testing to the UK based Paint Research Association achieving several internationally recognised standards of performance. Climashield™ if applied by a Smartseal registered contractor comes with a 10-year roof coating guarantee against flaking, peeling or lifting of the roof coating. If you require a FREE no obligation quotation for roof cleaning or repairs plus roof coating in Cromer, Great Yarmouth, Dereham or Wymondham in Norfolk, then please call us now on 0800 849 9498 or complete our online enquiry form.